The Koch network has previously said they will not back Republican candidate Donald Trump, but on Saturday officials told reporters that they would not run negative Clinton spots, a position taken by some Republican groups that are uneasy with the controversial GOP standard-bearer. The group is laser-focused on maintaining and expanding the Senate majority — in the midst of a $42 million television advertising campaign focused on a half-dozen states — and would only use Clinton to bash Senate Democratic hopefuls. Network officials outlined their plans here as 400 of their donors prepared to hear from a roster of Republican leaders. House Speaker Paul Ryan is among the politicians who scored invites to one of the nation’s most sought-after political retreats at a lavish campus nestled in the Rocky Mountains. Ryan will be joined here at the summit hosted by the Freedom Partners Chamber of Commerce alongside up-and-coming Republicans like Senators Cory Gardner of Colorado, Tim Scott of South Carolina, and Mike Lee of Utah, Koch spokesman James Davis said Saturday. Other speakers will include Senate Majority Whip John Cornyn of Texas, Kentucky Gov. Matt Bevin, Rep. Jason Chaffetz of Utah and Rep. Mike Coffman of Colorado. Hillary Clinton’s campaign apparently has a love-hate relationship with the American flag. While they seemingly couldn’t get enough of them in Philadelphia, they’re literally discarding them in Pittsburgh. Pittsburgh Tribune-Review reporter Jason Cato posted a photo from inside Clinton’s Saturday rally in Pittsburgh that showed a pile of “confiscated” American flags in a heap on the floor. American flags confiscated and piked on floor @HillaryClintonevent in #Pittsburgh . 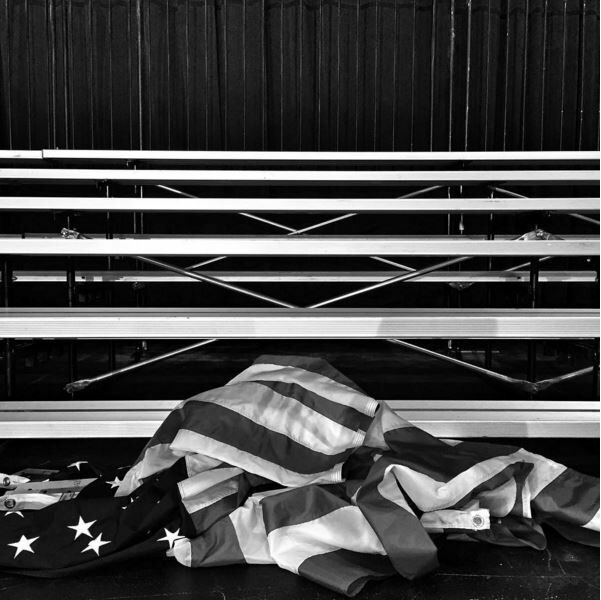 “American flags confiscated and (piled) on floor at Hillary Clinton event in Pittsburgh,” Cato notes. It’s not the first time the Clinton campaign has been caught disrespecting the flag. In February, the Washington Post tweeted a disturbing photo that may show what some Hillary Clinton staffers really think about the American flag. “With many hours to go, Clinton’s staff has flags ready for their election night party,” the paper tweeted. The campaign appears to be violating basic flag etiquette. The timing of the disappearance is particularly inopportune.“German authorities were notified and are working with the Army on the investigation,” said Johnson. On Friday, a Dublin court sentenced three senior bankers to up to 3.5 years in prison for conspiring to defraud investors during the 2008 banking crisis. The convictions were seemingly applauded by Irish taxpayers concerned over a lack of accountability. Former Irish Life and Permanent Chief Executive Denis Casey received two years and nine months after being found guilty in the country’s longest trial, which lasted 74 days. The ex-finance director at the failed Anglo Irish Bank, Willie McAteer, got 42 months, while John Bowe, the bank’s former-head of Capital Markets, was sentenced to 24 months. The three were found guilty of conspiring to mislead investors, lenders, and depositors into believing the infamous bank was still afloat. The bankers set up a 7.2-billion-euro circular transaction scheme from March to September of 2008 to increase Anglo’s balance sheet. Irish Life used a non-banking subsidiary to make deposits, passing them off as customer deposits and not money coming in from another bank, which is considered to be much more secure. The three jail sentences are some of the first in the world resulting in bankers facing prison time for their role in the 2008 crisis, which severely hurt Ireland’s economy and triggered a three-year sovereign bailout in 2010. The crisis still seems far from over in Ireland and elsewhere.Meanwhile, two other Anglo-Irish bankers, chief operations officer Tiarnan O’Mahoney and former company secretary Bernard Daly had their jail time waved on appeal after spending only several months in prison. The Irish finance ministry said in June that it could be another 15 years before the country gets back the money it invested in the banks that were going under during the crisis. Local media said Irish taxpayers have welcomed the court’s decision, after criticizing the government for failing to act. Ireland used up €64 billion of taxpayer money to pay for what is known as the largest state bank rescue in the Eurozone. None of the senior bankers in the US or UK have faced jail time. Their maximum sentences for wrongdoing involved fines and settlements. Meanwhile, financial problems continue to plague European banks, and now threaten the world’s oldest surviving bank – Italy’s Monte dei Paschi di Siena. The latest stress tests conducted by the European Banking Authority (EBA) revealed that the historic bank, founded in 1472, would go bust should Europe suddenly face another severe economic downturn. The EBA’s results showed that Monte dei Paschi di Siena’s capital buffer would run almost completely dry by 2018. The bank’s current capital buffer is 12.1 percent, but under the EBA’s “adverse” scenario it would fall to 2.2 percent by 2018. Overall, the stress tests highlighted the still very weak state of the banking system in Europe following the crisis. The EBA exposed the “risky” state of other major European banks, including the German giant Deutsche Bank, whose capital ratio has dropped from 11.1 to just 7.8 percent. The International Monetary Fund had already listed the bank as one of the major risks to global financial stability. The stress tests also noted the declining capital position of the bailed-out Royal Bank of Scotland. Overall, the weakest results came from countries such as Italy, Ireland, Spain, and Austria. The report raises the risk to the outlook at a time Federal Reserve policy makers are looking for sustained improvement, Where consumers were resilient last quarter, businesses were cautious — cutting back on investment and aggressively reducing stockpiles amid weak global markets, heightened uncertainty, and the lingering drag from a stronger dollar. Donald Trump is “truly shameless” to attack Muslim Khizr Khan and his wife for repudiating the former reality TV star at the Democratic convention, according to the Clinton campaign. Khizr spoke at the convention in Philadelphia earlier this week, strongly repudiating Trump’s immigration policies. Khizr and his wife Ghazala, who stood by his side while giving the speech, had a son who was an Army captain who died in Iraq back in 2004. On Saturday, Trump pointed out that his wife was silent during the speech. “I’d like to hear his wife say something,” he said in a New York Times interview, which was taken as a suggestion that she was silent because she is a Muslim woman. Trump’s response earned a sharp rebuke from the Clinton campaign on Saturday. Britain’s most dangerous extremists will be forced to undergo a mandatory “deradicalisation” programme, in a major overhaul of the Government’s counter-terror strategy. The “intensive” scheme could be used to target jihadists who have returned to Britain from Syria with psychological help, or to change the minds of radicals who support terrorist ideologies in the UK. Where it is legally possible, the Government will make it mandatory for individuals to attend these sessions, under the plan. It forms part of the Government’s anti-terrorism strategy, which is being reviewed in light of the wave of attacks in Europe, to strengthen security at airports, on trains and at major public events. The strategy is likely to include dramatically increasing the number of spies to uncover terrorist plots, more armed police to stop jihadist gun attackers, a new scheme to protect Britain against a “mass impact biological attack” and tougher measures to stop terrorists getting hold of explosives from commercial and military stocks. So, as we reported last night, something had to be done. And something was done: Reuters “tweaked” its polling methodology. Sure enough, here are the results of the “revised” poll released on Friday night. Democratic presidential candidate Hillary Clinton held a 6- percentage-point lead over Republican rival Donald Trump, according to a Reuters/Ipsos poll with new wording that was released on Friday, the day after she formally accepted her party’s nomination for the Nov. 8 election. Nearly 41 percent of likely voters favor Clinton, 35 percent favor Trump, and 25 percent picked “Other,” according to the new July 25-29 online poll of 1,043 likely voters, which overlapped with the Democratic National Convention in Philadelphia. The poll has a credibility interval of 4 percentage points. Or rather, it has “siphoned” support from Hillary to Trump, something which the “internal review” had clearly noticed, and promptly stopped. The pro forma, or “slightly revised” Reuters/Ipsos poll goes back only one week, and all prior data appears to have been eliminated. And that, dear readers, is how one tumbles from a 1-point lead to a 6-point loss in 3 days thanks to the miracle of a polling “adjustment.” Because if it works to “boost” GDP, why shouldn’t it work for Hillary as well?